Gene Kloss was born Alice Geneva Glasier, in Oakland, California. She studied at the University of California, Berkley (graduating with honors in Art in 1924) and the California School of Fine Art in San Francisco. 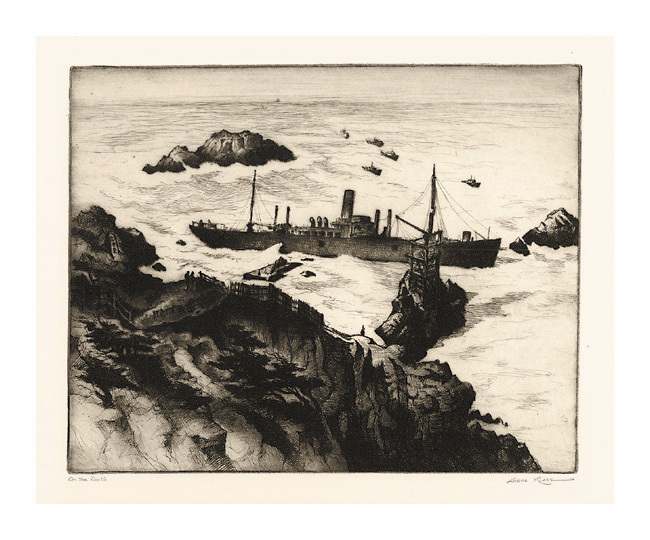 With the encouragement of her professor, Perham Nahl, she began etching in 1927. In 1925, she had married Phillips Kloss and shortened her name, adopting the masculine form of her middle name so that her work would be viewed with an unprejudiced eye and so she would not be denied entry into exhibitions. That same year she visited Taos. 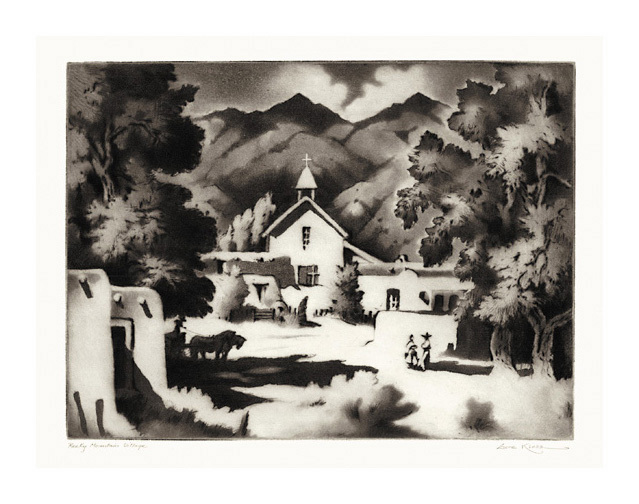 She and Phillips divided their time between Berkley and Taos, hauling her Sturges press back and forth until they finally settled permanently in Taos in 1945. 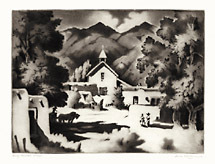 During the Depression, Kloss resided in Taos and produced prints for the WPA from her own studio, there being no graphic workshop in New Mexico at the time. She maintained memberships in many art organizations including the Society of American Etchers, the Chicago Society of Etchers, the California Society of Etchers, the California Society of Etchers, the Carmel Art Association, the Prairie Print Makers, the New Mexico Art League, and the Philadelphia Watercolor Club. Kloss was elected an Associate in the National Academy of Design in 1950 and to full Academician in 1972. She received numerous awards for her prints which were included in the Fine Prints of the Year annuals and other publications. 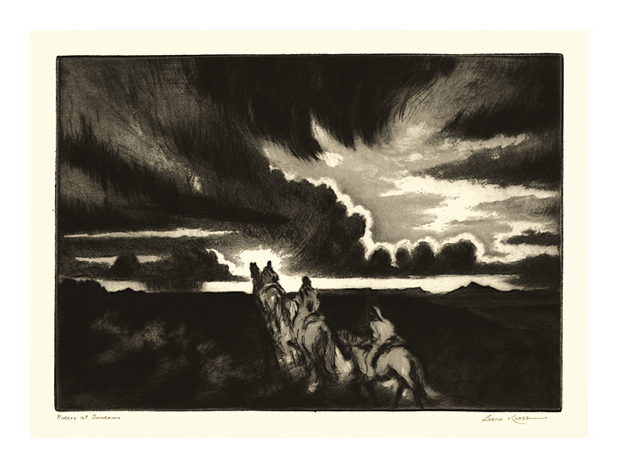 Her work is held in numerous museum collections including the Art Institute of Chicago, the Library of Congress, the New York Public Library, the Smithsonian Institute, the San Francisco Museum of Art, the Dallas Museum, the Oakland Museum, and the Museum of New Mexico in Santa Fe. 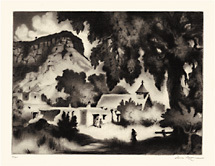 Rocky Mountain Village - - 1945, Aquatint and Drypoint. Kloss 401. Edition 50. Signed and titled in pencil. Image size 8 3/4 x 12 inches (222 x 305 mm); sheet size 10 13/16 x 15 3/8 inches (275 x 391 mm). A superb, richly inked impression, in warm black ink, on off-white wove paper, with full margins (7/8 to 1 7/8 inches), in excellent condition. 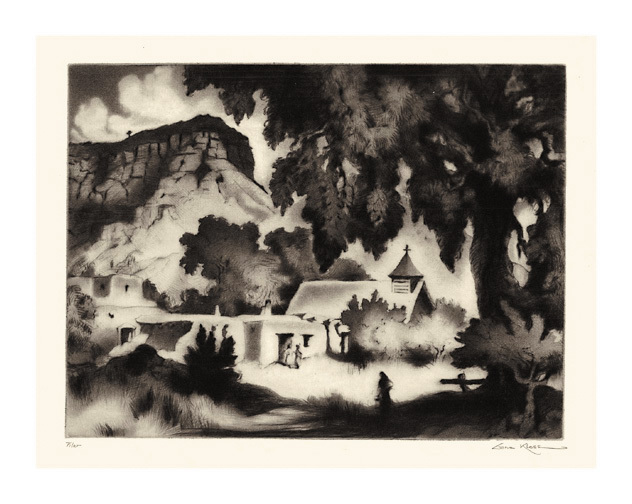 Pilar - - 1945, Aquatint and Drypoint. Kloss 400. Edition 75. Signed and titled in pencil. Image size 8 7/8 x 12 inches (225 x 305 mm); sheet size 10 5/8 x 15 1/4 inches (270 x 387 mm). A superb, richly inked impression, in dark brown ink, on cream wove paper, with full margins (3/4 to 1 3/4 inches), in excellent condition. 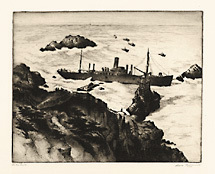 On the Rocks - - 1946, Etching. Kloss 409. Edition 75. Signed and titled in pencil. Image size 9 7/8 x 12 9/16 inches (251 x 319 mm); sheet size 13 3/4 x 18 1/4 inches (349 x 464 mm). A fine, rich impression, on cream wove paper, with full margins (1 7/8 to 3 inches), in excellent condition. 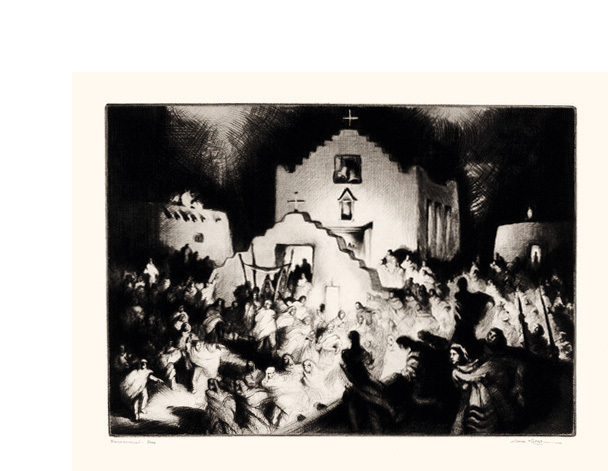 Illustrated in Gene Kloss Etchings, Phillips Kloss, Sunstone Press; New Mexico, 1981. 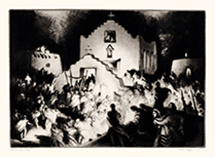 Processional Taos - - 1948, Aquatint and Drypoint. Kloss 431. Edition 250. Signed and titled in pencil. Image size 9 7/8 x 13 15/16 inches (251 x 354 mm); sheet size 12 1/4 x 16 1/2 inches (311 x 419 mm). A superb, richly inked impression, in dark brown ink, on cream wove paper, with full margins (1 to 1 1/4 inches), in excellent condition. THE SOCIETY OF PRINT CONNOISSEURS blindstamp in the bottom left margin. Reproduced: Graphic Excursions, American Prints in Bkack and White, 1900-1950, Godine,1991. Collections: Library of Congress (Pennell Fund purchase), Reba and Dave Williams. 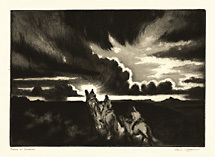 Riders at Sundown - - 1953, Aquatint and Drypoint. Kloss 451. Edition 75. Signed and titled in pencil. Image size 8 1/4 x 11 7/8 inches (210 x 302 mm); sheet size 11 1/8 x 16 1/2 inches (283 x 419 mm). A superb, richly inked impression, in dark brown ink, on cream wove paper, with full margins (1 1/2 to 2 3/8 inches), in excellent condition.